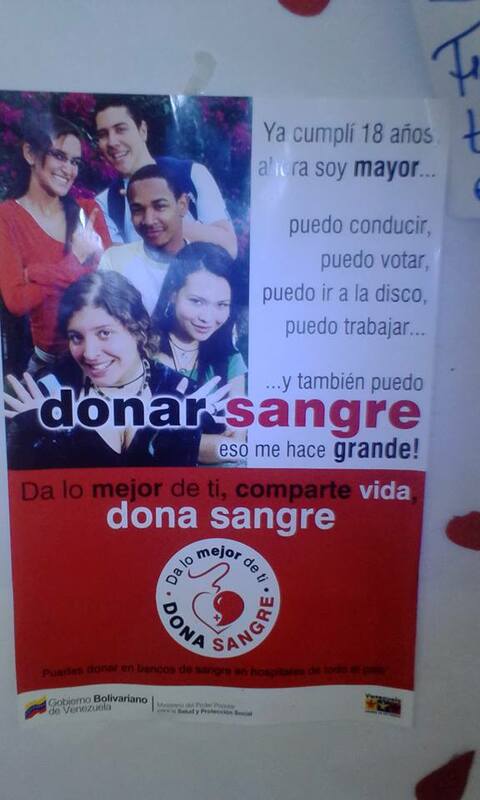 Da lo mejor de ti, comparte vida, dona sangre. Todos los años en el hospital (Los magallanes de catia) se siembra conciencia a cerca de la importancia de donar sangre. En venezuela, no hay costumbre de donar sangre, solo cuando un familiar la requiere es que aparecen los donantes, para cubrir la operación de su paciente, he visto muchos casos de muertes por falta de sangre. No haber sufrido de hepatitis. No sufrir de hipertension arterial. No haber sido vacunado recientemente. No haber ingerido licor en 48 horas. No estar bajo prescripción medica. Buena iniciativa, donar sangre es una muy buena obra hacia los demás. Que bien que apoyes buenas obras. Congratulations! This post has been upvoted from the communal account, @minnowsupport, by onswitch from the Minnow Support Project. It's a witness project run by aggroed, ausbitbank, teamsteem, theprophet0, someguy123, neoxian, followbtcnews/crimsonclad, and netuoso. The goal is to help Steemit grow by supporting Minnows and creating a social network. Please find us in the Peace, Abundance, and Liberty Network (PALnet) Discord Channel. It's a completely public and open space to all members of the Steemit community who voluntarily choose to be there. This post has received a 100% upvote from @melowd. Thank You for sharing @onswitch. For more information, click here! This post has been ranked within the top 25 most undervalued posts in the first half of Aug 12. We estimate that this post is undervalued by $31.75 as compared to a scenario in which every voter had an equal say. kindest act by sharing a piece of you to people whom really need it badly. nice post!